Bamboo is one of the most elegant and cost effective plant choices for creating a privacy screen or hedge. Bamboo’s ability to grow quickly will allow you to design the hedge with wide spacing, and still create an effective privacy screen. The cost per foot of height is amazingly low compared to other plants used to hedge, such as Cypress or Juniper trees. 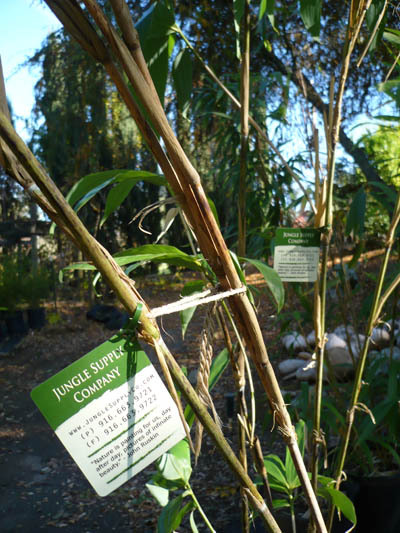 Many bamboo nurseries can provide 10ft+ tall plants for under $100. Bamboo hedges are excellent for a variety of applications, including ornamental garden hedges, windbreak hedges, and privacy fences. There are many species of bamboo that can be used to construct a privacy fence. No other plant can provide such a wide range of colors and design options. An ideal hedge bamboo will branch close to the ground and reach a moderate height. The choice of bamboo will also depend on your local climate, so always check the hardiness chart before choosing a bamboo variety. This method involves digging a trench and planting rhizome cuttings, which could be compared to planting a flower bulb. This same method can be applied to established plants. It is always best to plant bamboo in mid-late spring, ideally when daily high temperatures range from 60 to 85 degrees F. Privacy Screen Bamboo species will thrive in areas that receive full sunlight. Soil conditions should fertile, with high humus content and full drainage. You can add well rotted manure to improve the fertility of the soil. An effective privacy screen should always planted under these ideal conditions. Start by digging a trench 18 inches (1.5 feet) deep and 36 inches (3 feet) wide. Provide a minimum of 5 feet of space away from any existing fence lines. Running bamboo has the ability to spread quickly, so wide spacing can provide an effective privacy hedge after several years of growth. Planting Established Plants: Young, healthy bamboo plants should be selected for your privacy hedge. Cut the stems of the plant down to 1 foot. Provide 1 to 3 feet of spacing on each side. Cover the plants with 6 inches of loose soil up to the natural soil line. A layer of mulch is helpful to protect the base of the plant. Do NOT overwater bamboo! This is one of the most common pitfalls of bamboo growers. The newly planted rhizomes or plants should only need 2 inches of water every 4 days. Make adjustments to this based on the rain levels in your area. You can also add a basic fertilizer once per month if the plants are struggling.